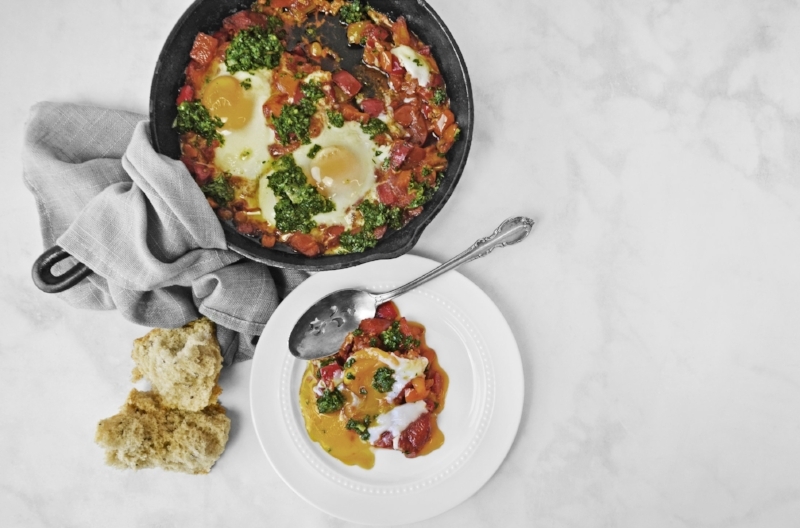 This year's trendiest egg prparation has to go to Shakshuka, a Middle Eastern staple. The saucy egg dish is essentially a tomato and pepper stew, which we've spiced up with our Ethiopian Berbere Blend. This is an egg-cellent opportunity to showcase local and heirloom eggs. In a heavy-bottomed or cast iron skillet over medium-low heat, sweat the onions and peppers in the olive oil until completely tender, about 15 minutes. Increase the heat to medium-high, and add the garlic and berbere spice. Saute for 2-3 minutes, until tender, and then add the chopped tomatoes. Stir to combine, and bring to a simmer. Simmer for 15-20 minutes, or until the tomatoes start to break down. Season to taste with salt and pepper, then gently crack the eggs onto the top of the spiced tomato sauce. Reduce the heat to medium-low, and slowly cook the eggs until the whites are cooked through, but the yolks are still runny. Spoon some of the gremolata over the shakshuka. Serve family style, or spoon some of the shakshuka onto a serving plate. Accompany with grilled bread, warm pita, or crisp flatbread. While the tomatoes are simmering, prepare the Gremolata. Prepare the ingredients as directed, then stir them together in a mixing bowl. Set aside until ready to serve.